Despite being a prolific Game Maker developer with a large indie following, Infernal Edge is the first release from Lazy Brain Games that I've personally considered worthy of reviewing here at RGCD. It may be little more than a prototype and feature LBG's trademark retina-burning, high-contrast (and quite frankly mediocre) pixel art, but the game still won me over with it's interesting design and classic arcade-style robot-blasting gameplay regardless. Infernal Edge sees the protagonist scaling the exterior of Space Station LV-427, a human outpost held under siege by interstellar robotic aggressors and somewhat dubiously decorated with a plethora of deadly wall-mounted features including laser turrets, spleen-ripping disc saws and bone-crushing spikes. 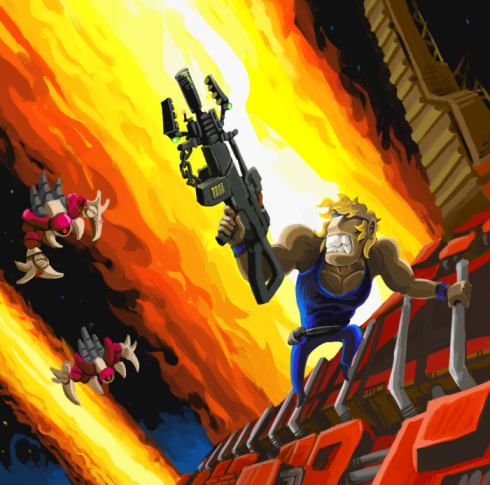 To aid our super-soldier hero (who is in fact so super that he doesn't need to wear a spacesuit on the outside of the station), he's been supplied with a dual action, switch-able weapon system that acts as both a machine gun and grappling hook. The game is controlled via WASD on the keyboard and the mouse aims your cursor, with the right button switching between grapple and gun, and the left button firing. It would have probably made more sense to simply assign each device to a separate mouse button, but nonetheless it's a system that works quite well and within minutes you'll be grappling and blasting your way through the game's single (yet long) level with relative ease. 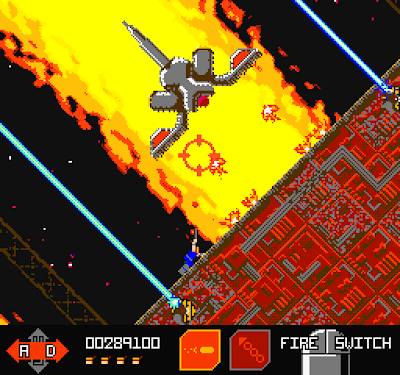 Together with the decent level design, the other standout feature of the game is the fake SNES Mode 7 style rotating graphics; as you climb up/along the outside of the station the screen rotates in a disorientating fashion, making this otherwise two-dimensional game feel a lot more dynamic - and at points this results in the controls swapping from Up/Down to Left/Right (you can only move on one axis at a time). The three bosses are also noteworthy, requiring the use of both grappling hook and gun to destroy, and the addition of an online scoreboard is another nice touch. 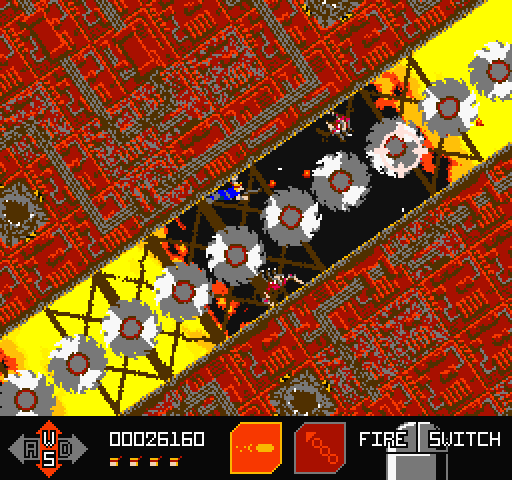 On the subject of enemies, it has to be said that there's not a huge amount of variation; the spider drones in particular act as little more than cannon fodder whereas the jetpack mounted, homing-missile launching robots prove to be only slightly more challenging thanks to their slow attack speed. In fact, once you've memorised the layout of the level map, locations of hazards and the boss attack sequences, the game can be beaten with ease and there's little to draw you back - some random elements would have been very welcome and made the game considerably more replayable. Other slight annoyances include the lack of customisable options (there's no frontend menu to the game whatsoever), and the fact that you are forced to play fullscreen with badly blurred graphics thanks to GM's default graphics scaling. However, as a prototype Infernal Edge is a solid and enjoyable little game that is great whilst it lasts, and the concept is something that I'd love to see expanded on further - albeit with some replay value added. Here's hoping for a sequel. Download the game here (from the Lazy Brain Games website). Original gameplay and cool retro style_!